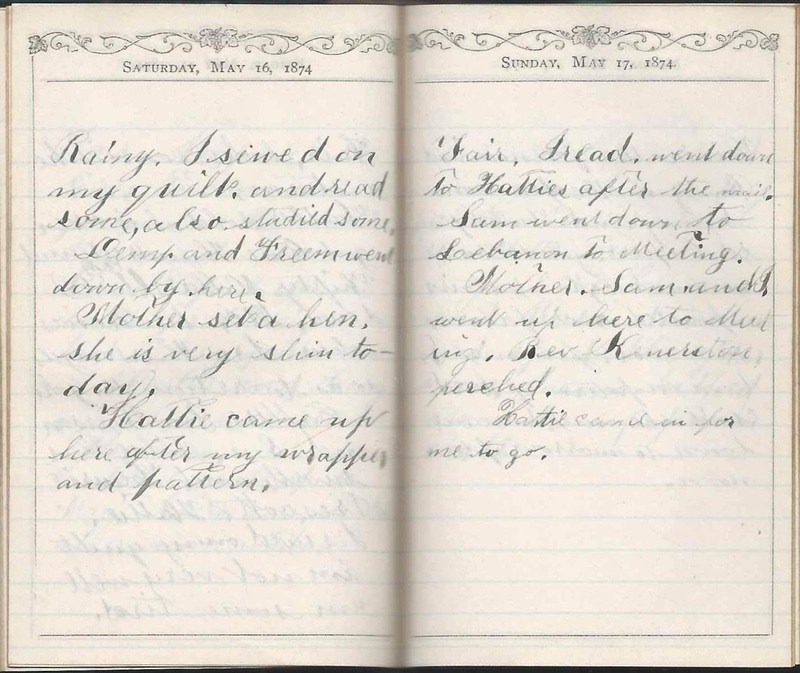 May entries in the 1874 diary of Ida Isadore Reynolds (1860-1946) of Acton, Maine. 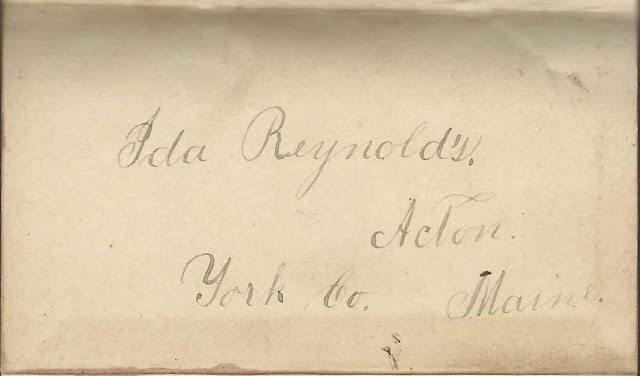 Ida would marry John Jotham Shapleigh (1856-1923) in 1881. 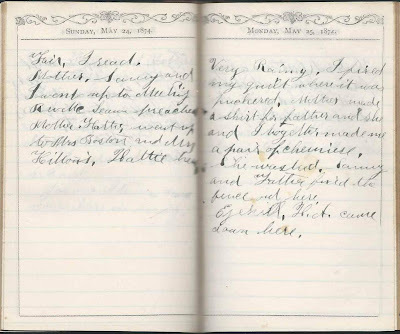 Links to the months of April 1874 and June 1874 appear here and at the end of this post. 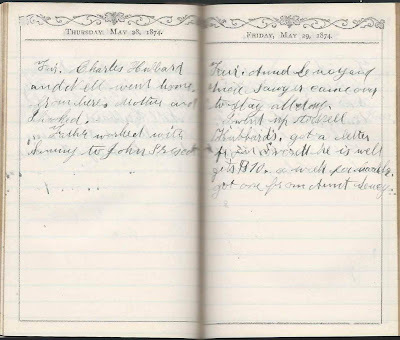 Thursday, April 30, 1874: Very Cold, never known such a time. I knit. Started a mitten. Went to Hattie's and stayed all night. Joanna Stevens here. 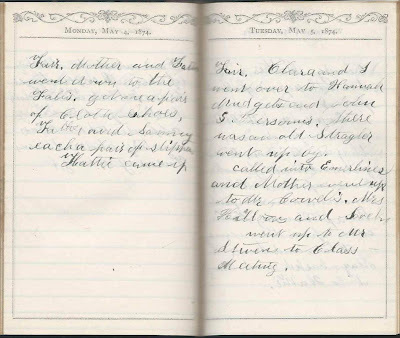 Friday, May 1, 1874: Fair. Snow went away very fast. I knit a mitten and finished that one. Mrs. Boston here and took dinner. Hattie here in the evening. Hiram Barrows here. 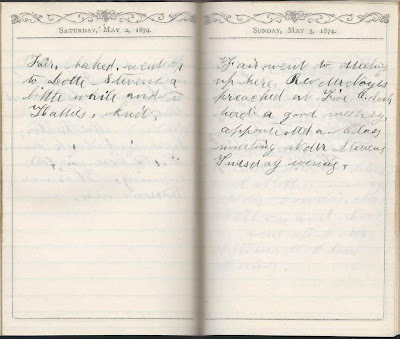 Saturday, May 2, 1874: Fair. Baked. Went up to Lotte Stevens a little while and to Hattie's. Knit. 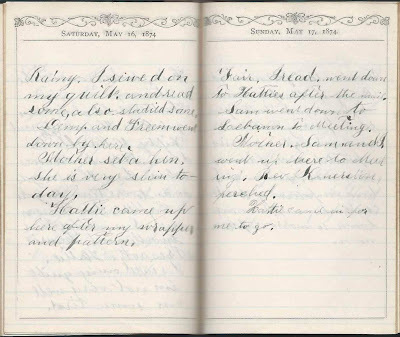 Sunday, May 3, 1874: Fair. Went to Meeting up here. Rev. Mr. Noyes preached at Five o'clock. Had a good meeting. ____[appointed ?] a Class meeting at Mr. Stevens Tuesday evening. 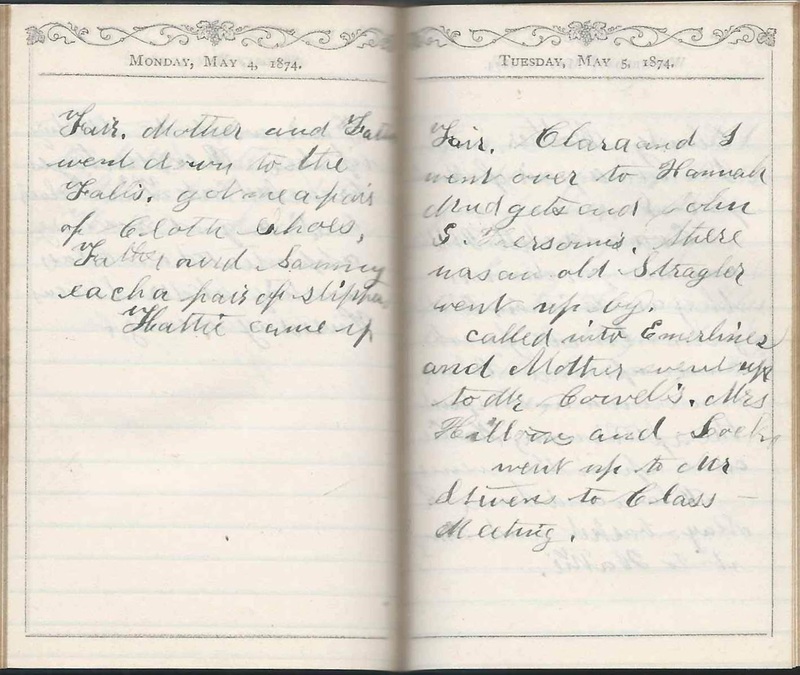 Monday, May 4, 1874: Fair. Mother and Father went down to the Falls. Got me a pair of Cloth Shoes. Father and Sammy each a pair of slippers. Hattie came up. 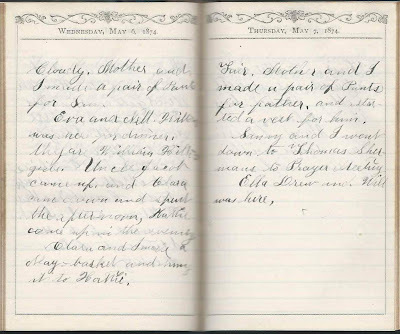 Tuesday, May 5, 1874: Fair. Clara and I went over to Hannah Mudgett's and John S. Hersom's. There was an old Straggler went up by. Called into Emerline's and Mother went up to Mr. Cowell's, Mrs. Hilton's and Locks. Went up to Mr. Stevens to Class Meeting. 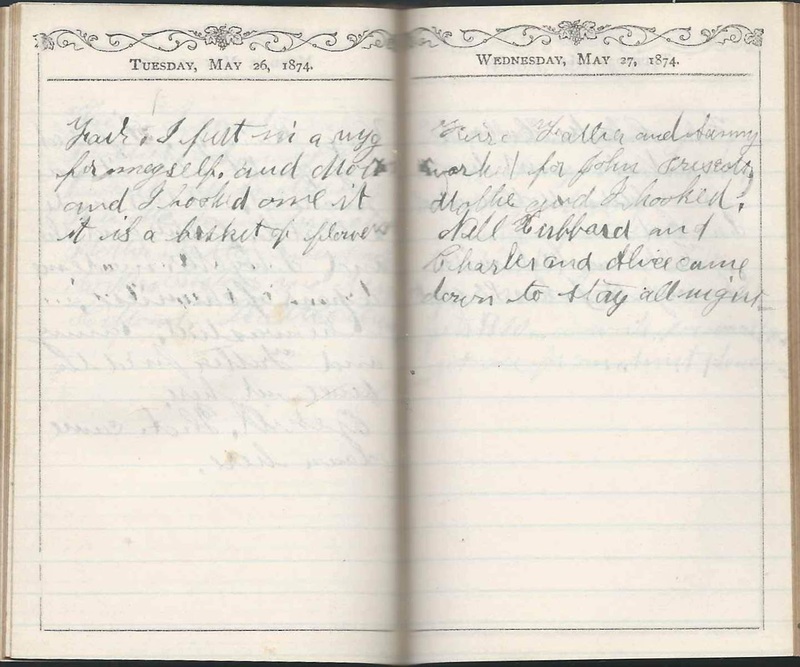 Wednesday, May 6, 1874: Cloudy. Mother and I made a pair of Pants for Sam. Eva and Nell Hilton was here for dinner. They are William Hilton's girls. Uncle Jacob came up and Clara came down and spent the afternoon. Hattie came up in the evening. Clara and I made a May basket and hung it to Hattie. 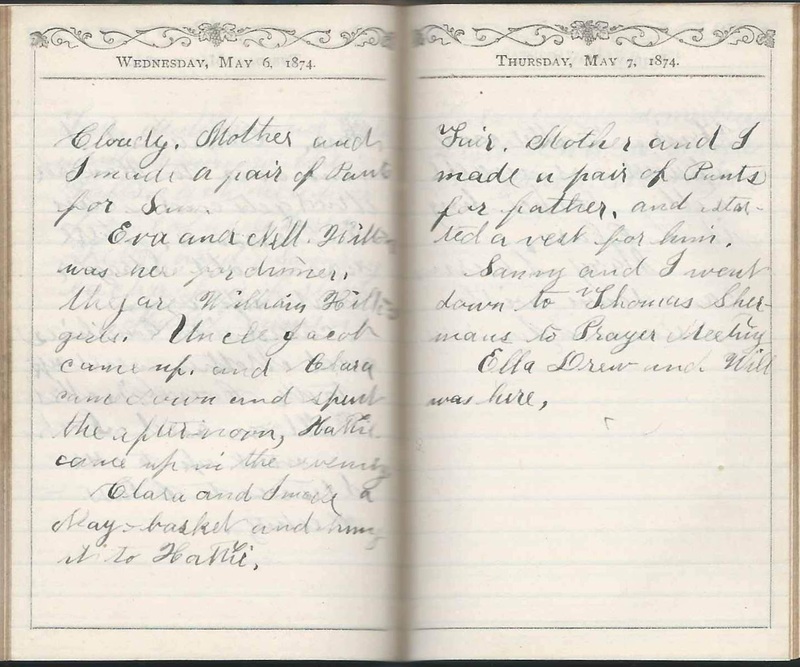 Thursday, May 7, 1874: Fair. Mother and I made a pair of Pants for Father and started a vest for him. Sammy and I went down to Thomas Sherman's to Prayer Meeting. Ella Drew and Will was here. 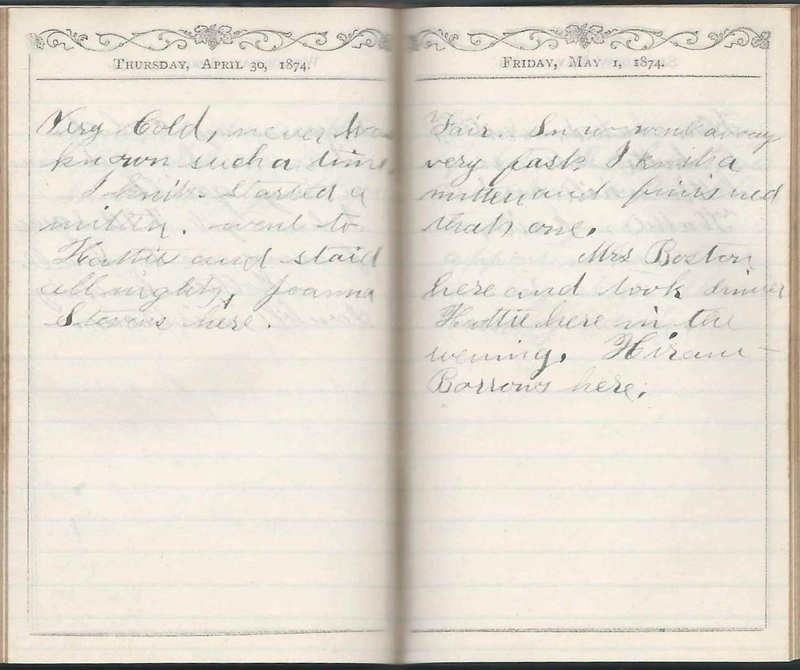 Friday, May 8, 1874: Fair. Hattie came up and we made a May basket, bring it to Clara. Mary Sherman came down with Carlos and Joanna. 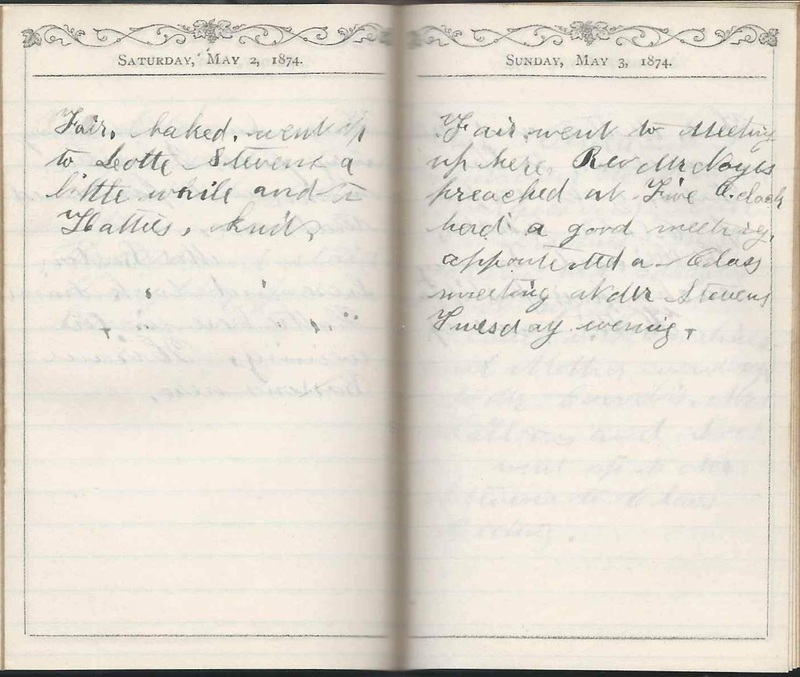 Saturday, May 9, 1874: Fair. Baked some bread. Went down to Hattie's and stayed all night. 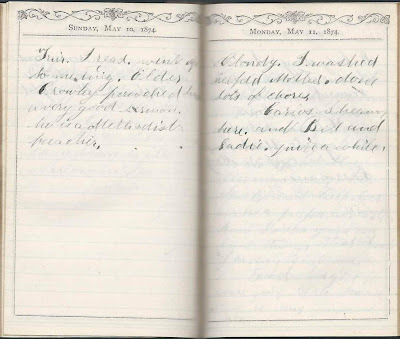 Sunday, May 10, 1874: Fair. I read. Went up to meeting. Elder Crowley preached a very good Sermon. He is a Methodist preacher. 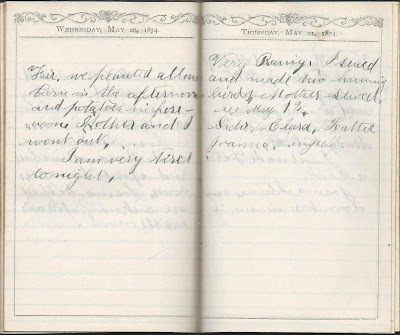 Monday, May 11, 1874: Cloudy. I washed, helped Mother. Done lots of chores. Carlos Sherman here and Bell and Sadie quite a while. 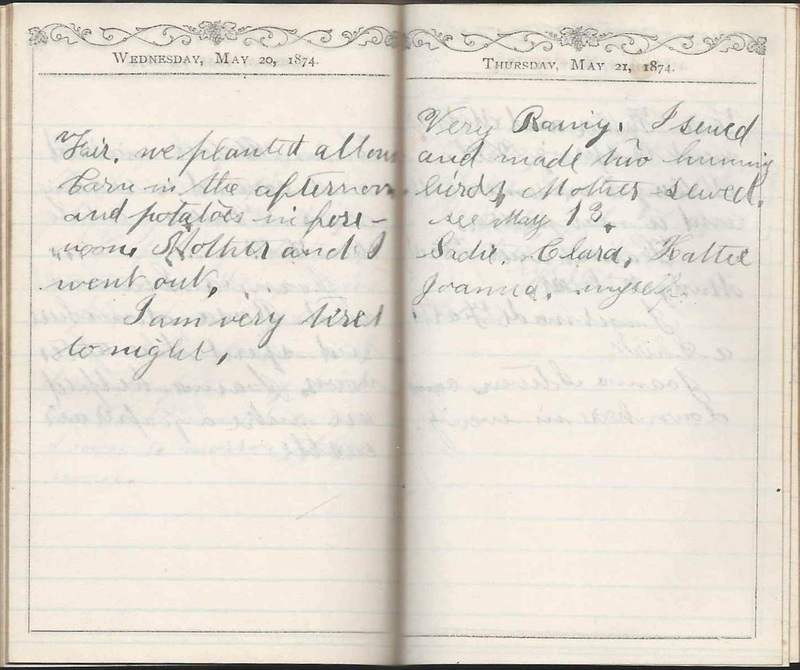 Tuesday, May 12, 1874: A lovely day. I ironed, darned stockings and scoured spoons. Done a number of chores. Father and Andrew went over to Uncle Sawyer's. I went up to Mary Sherman's. Carlos Sherman here. 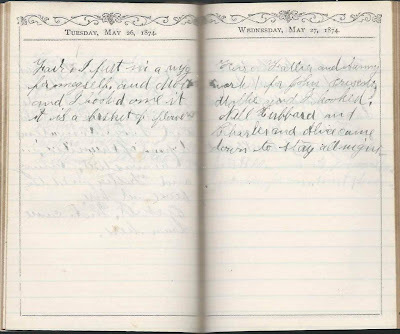 Wednesday, May 13, 1874: See May 21 [not sure what she means by this] Fair. Mother and I started in the forenoon and went down to Aunt Martha's. Got back in time to go to Hattie's to spend the afternoon with the Girls and help her make a paper air castle. Aunt Martha gave me some things that Aunt Joanna sent me. Good Night. We are going to see where we all will be ten years from now. 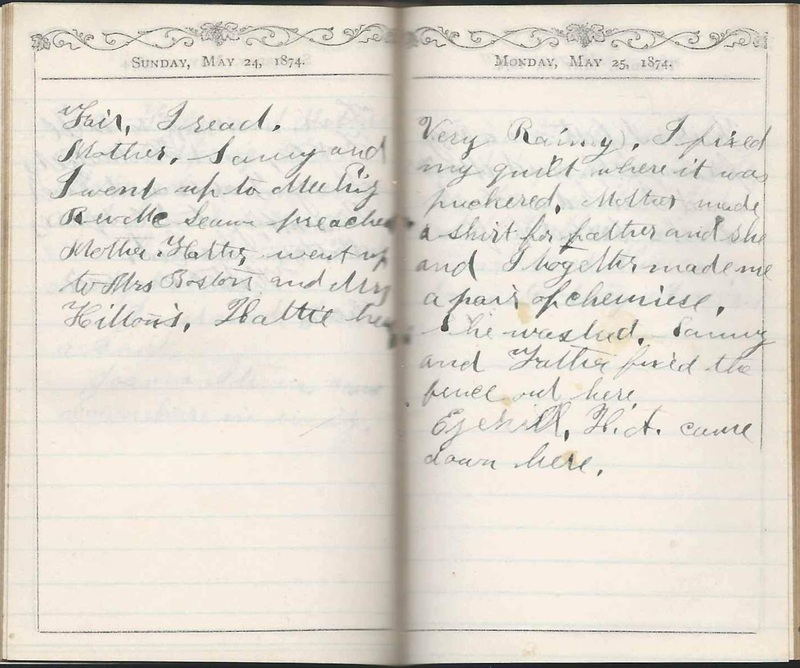 Thursday, May 14, 1874: Fair. I expected the Girls to come down to go down in the woods. They could not come. I went up to Mrs. S. to Prayer Meeting, had a very good time. Hattie and George was here most all the afternoon. Mother went up to Mary Sherman's in the afternoon for a while. 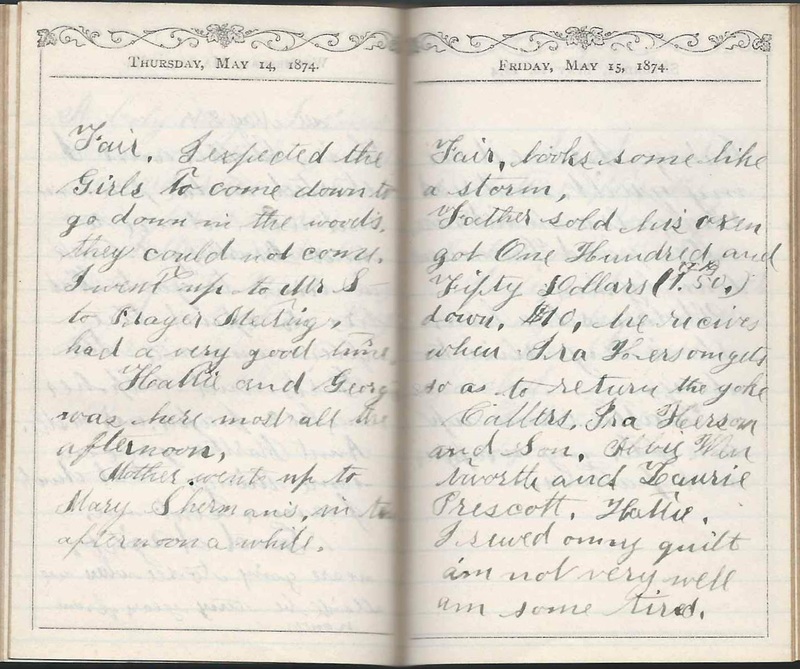 Friday, May 15, 1874: Fair, looks some like a storm. Father sold his oxen, got One Hundred and Fifty Dollars down. [not sure if she meant the sale price was $150 - or $100, with $50 down.] $10 he receives when Ira Hersom gets so as to return the yoke collars. Ira Hersom and Son, Abbie Wentworth and Laurie Prescott. Hattie. I sewed my quilt; am not very well, am some tired. 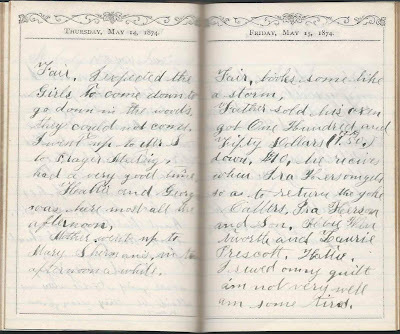 Saturday, May 16, 1874: Rainy. I sewed on my quilt and read some, also studied some. Demp and Freem went down by here. Mother set a hen. She is very slim today. 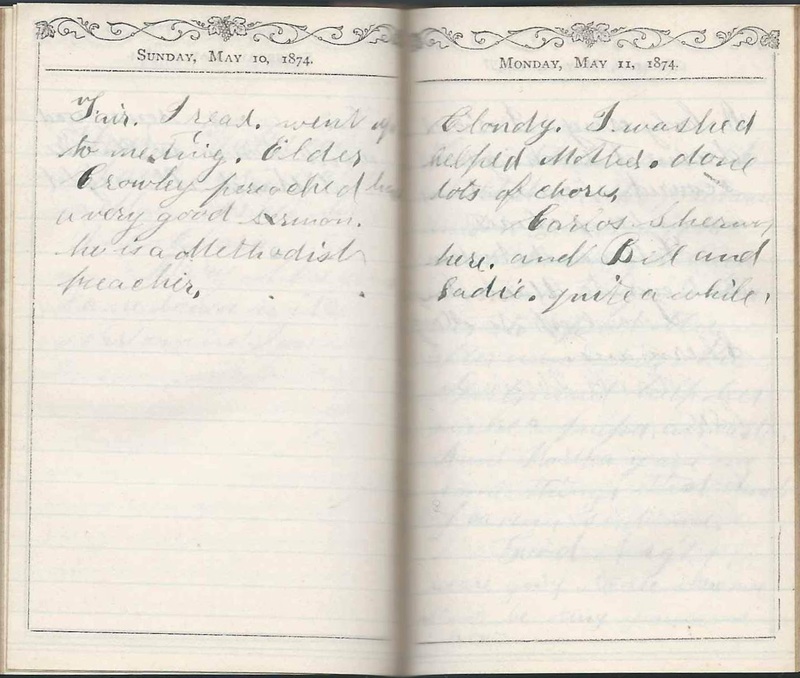 Sunday, May 17, 1874: Fair. I read, went down to Hattie's after the mail. Sam went down to Lebanon to Meeting. Mother, Sam and I went up here to Meeting. Rev. Kennerston preached. Hattie came in for me to go. 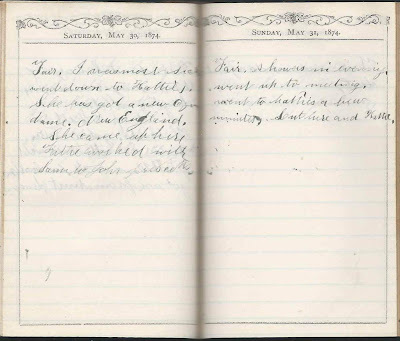 Monday, May 18, 1874: Fair in the forenoon and Rainy in the afternoon. Sammy and Father picked Capers, got two bushels. We moved beds upstairs, planted ___ flowers in a box. Joanna S. down for pattern of bird. said she would come down tomorrow afternoon. 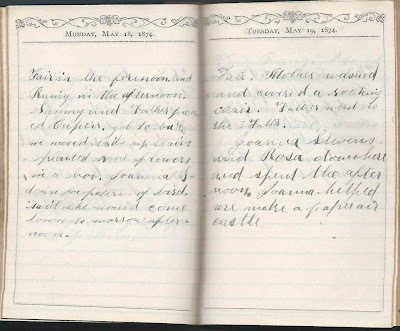 Tuesday, May 19, 1874: Fair. Mother washed and covered a rocking chair. Father went to the Falls. Joanna Stevens and Rosa down here and spent the afternoon. Joanna helped us make a paper air castle. 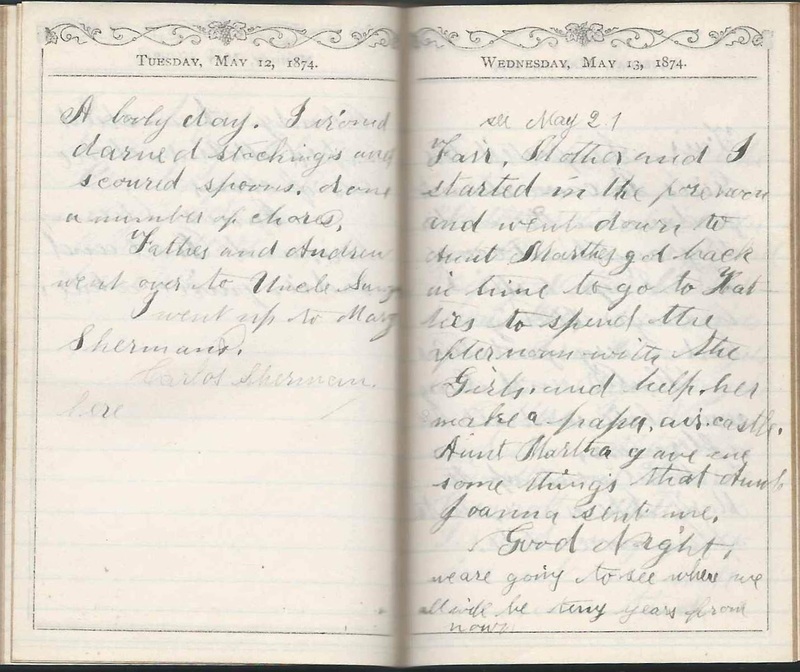 Wednesday, May 20, 1874: Fair. We planted all our Corn in the afternoon and potatoes in forenoon. Mother and I went out. I am very tired tonight. Sadie, Clara, Hattie, Joanna, myself. 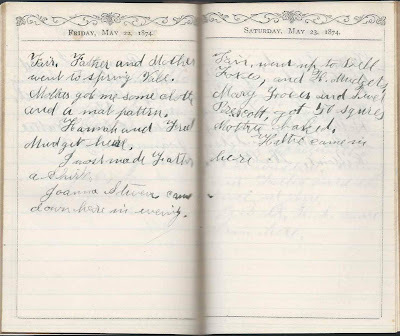 Friday, May 22, 1874: Fair. Father and Mother went to Spring Vale. Mother got me some cloth and a mat pattern. Hannah and Fred Mudgett here. I most made Father a shirt. Joanna Stevens came down here in evening. 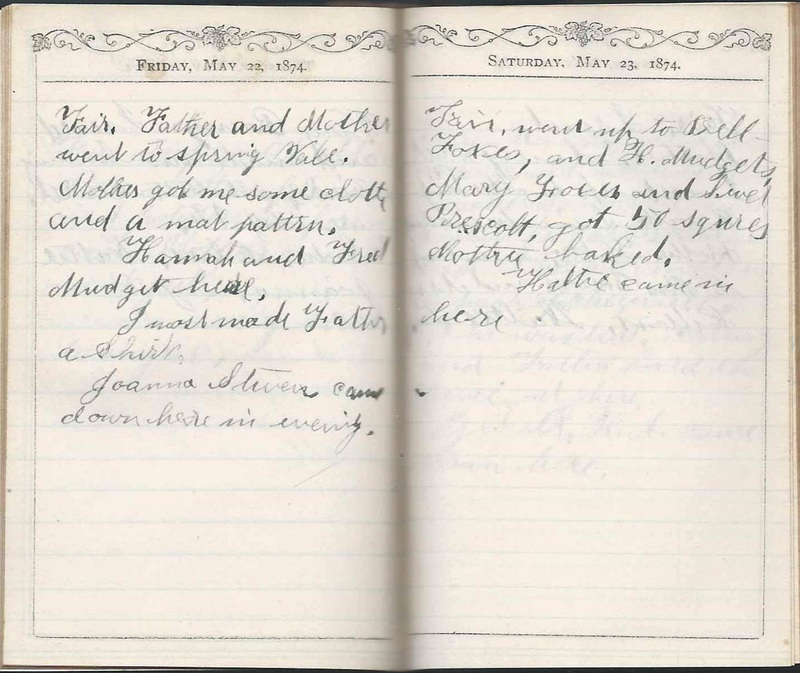 Saturday, May 23, 1874: Fair; went up to Bell Foxes and H. Mudgett's. Mary Foxes and Sewell Prescott. Got 50 squares. Mother baked. Hattie came in here. 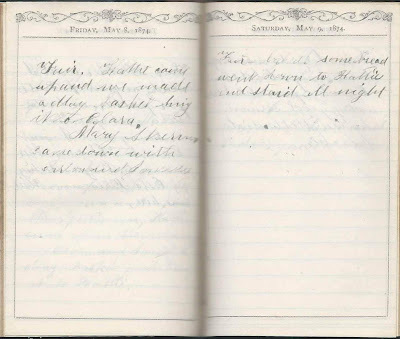 Sunday, May 24, 1874: Fair. I read. Mother, Sammy and I went up to Meeting. Rev. McLean preached. Mother, Hattie, went up to Mrs. Boston and Mrs. Hilton's. Hattie here. 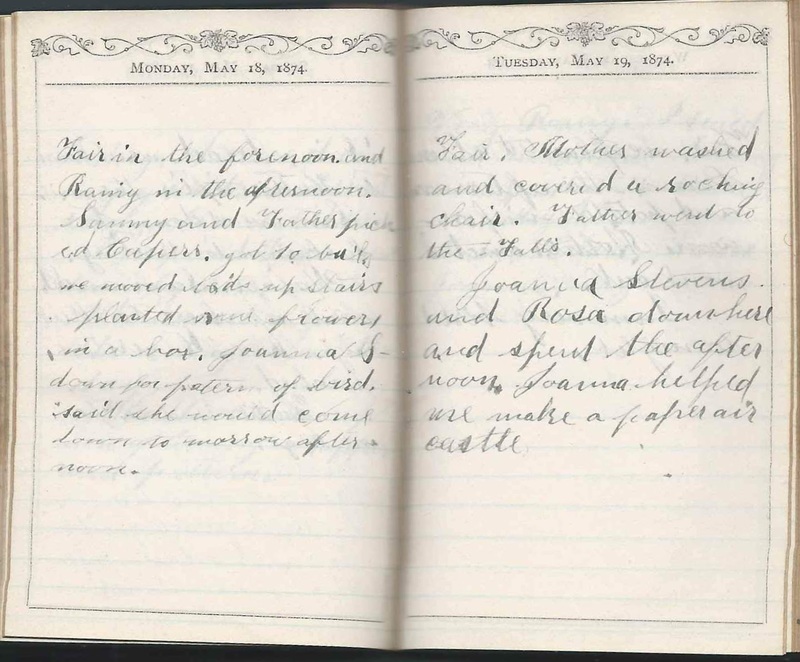 Monday, May 25, 1874: Very Rainy. I fixed my quilt where it was puckered. Mother made a shirt for father and she and I together made me a pair of chemises. She washed. Sammy and Father fixed the fence out here. Ezekiel H. A. came down here. 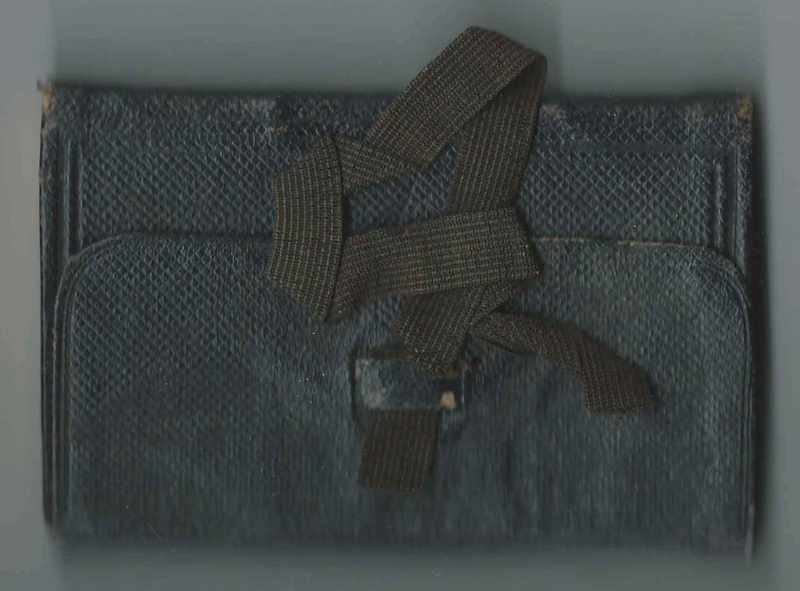 Tuesday, May 26, 1874: Fair. I put in rug for myself, and Mother and I hooked on it. It is a basket of flowers. Wednesday, May 27, 1874: Fair. Father and Sammy worked for John Prescott. Mother and I hooked. 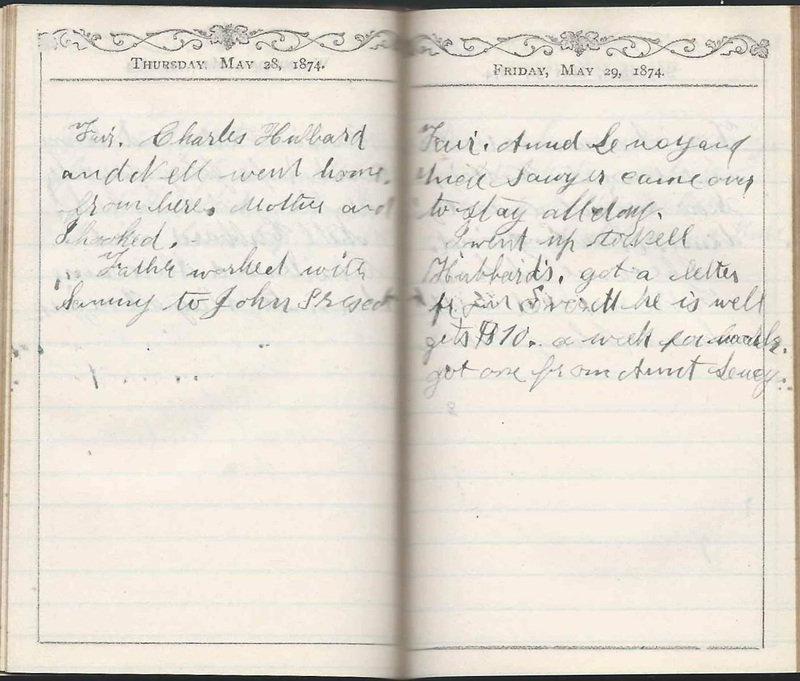 Nell Hubbard and Charles and Alice came down to stay all night. 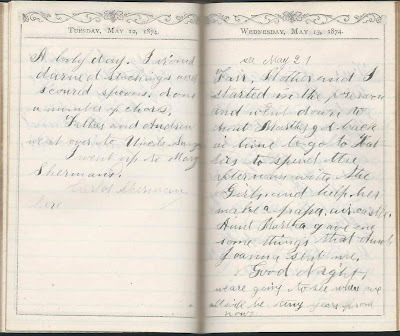 Thursday, May 28, 1874: Fair. Charles Hubbard and Nell went home from here. Mother and I hooked. Father worked with Sammy to John Prescott. 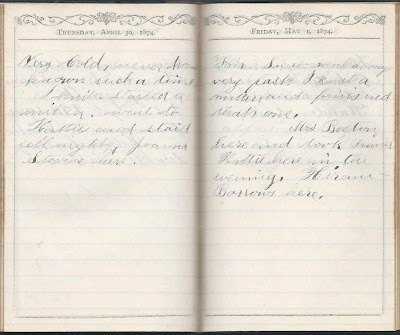 Friday, May 29, 1874: Fair. Aunt Lucy and Uncle Sawyer came over to stay all day. I went up to see Hubbards. Got a letter from Everett. He is well, gets $10 a week for ___. got one from Aunt Lucy. 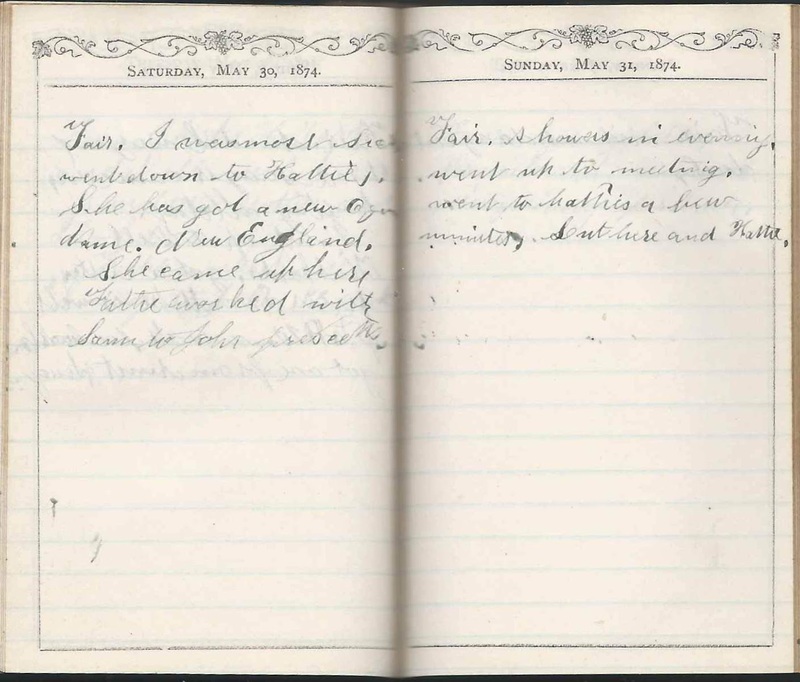 Saturday, May 30, 1874: Fair. I was most sick. Went down to Hattie's. She has got a new ___. New England. She came up here. Father worked with Sammy to John Prescott. 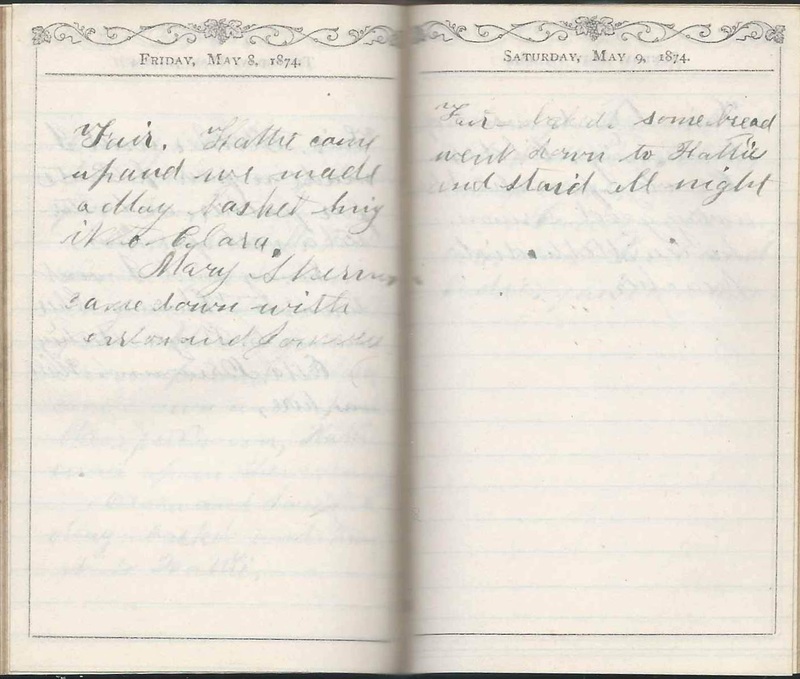 Sunday, May 31, 1874: Fair. Showers in evening. Went up to meeting. Went to Hattie's a few minutes. Lute here and Hattie. 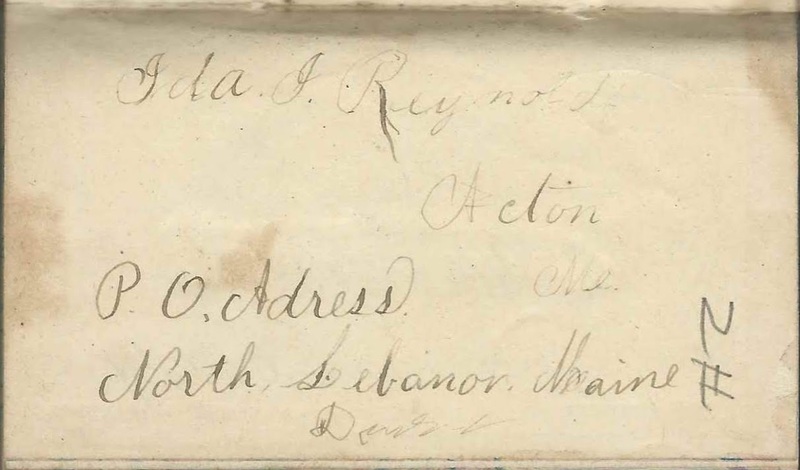 Ira Hersam - perhaps Ira Hersam (1822-1890), husband of Margaret (Hersam) Hersam (1823-1916); some records shows the surname as Hersom. Laurie Prescott - presumably Laura J. (Cowell) Prescott (1856-1892), first wife of Oren Burbank Cheney Prescott (1850-1925), "Cheney"
Advance to June 1874 or return to April 1874.